8 firemen. 2 enormous fire engines. 2 hours until twenty guests arrived. 1 embarrassed, tearstained cook. I'd been searing the chicken pieces, mushrooms and onions in small batches for about 40 minutes. I sloshed brandy into the pan to deglaze it and multiplied the quantity by ten for my huge batch. I wasn't surprised when the pan burst into flames but I was surprised by the rather large ball of fire in front of me and the way it wasn't going out, choosing to burn into the fan hood above the hobs and lick around the cupboards. I panicked, worried that the electrics in the fan were going to catch, grabbed my electric/liquid fire extinguisher, flung the tab to the floor and pressed the button. Hunched over, with my apron clenched to my mouth, I ran around opening windows as the house filled with a fog of white powder, reaching from the ceiling down to my waist. The smoke alarm kept ringing as the dust clouds bellowed out of the windows. My friend E, who lives across the street, let herself in and found me sitting on the gravel in the garden in tears, jabbing at my phone with a shaky finger. Four minutes later, the flashing blue lights of two huge fire engines turned down my road, their sirens coming to a stop as the men jogged down the road in full kit. They were so lovely, insisting that they checked everything while calming me down and assuring me it was better to overreact and be careful. They found my concern for the ruined food highly amusing and joked that I should call the local Indian for takeaway. Thankfully the only damage was the fan hood (it turns on but makes a horrible noise), the pan and some of the food and drink I'd prepared. Luckily I hadn't set out all the food on plates - that was my next job. 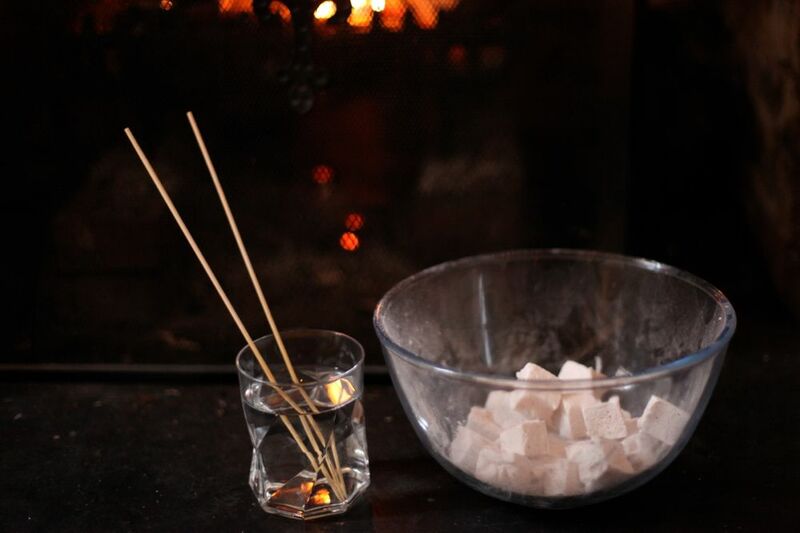 One of the casualties was a big tray of these marshmallows that I'd prepared so we could roast them in the fireplace. They looked so normal with their extra layer of white powder. I still had vanilla shortbread and mince pies waiting to be baked in the fridge. I had a few nets of clementines and the remnants of the gingerbread (one tin had been knocked to the floor in the chaos - many reindeer lost their heads and limbs). The cheese (an oozing slice of unpasturised Swiss vacherin, a hunk of manchego and a lovely goat cheese) was well wrapped and the crackers and little squares of quince membrillo I'd made were safe. I still had potatoes to bake, herby salad and some burnt and peeled peppers, along with strong cheddar and some tuna from the cupboard. Sadly I completely forgot to serve the tiny slices of salted caramel and cocoa nib brownie I had stashed in the freezer (though now I get to eat them...). We had enough. It wasn't perfect. I didn't have time to shower and change, so I spent the party in the old clothes I'd thrown on to clean that morning. The house wasn't too dirty but I hadn't had time to clean properly as we'd been frantically cleaning every single thing in the kitchen to get rid of the powder (which, miraculously, didn't seem to settle elsewhere). The food wasn't as I'd imagined it. But I was safe, as was the house. 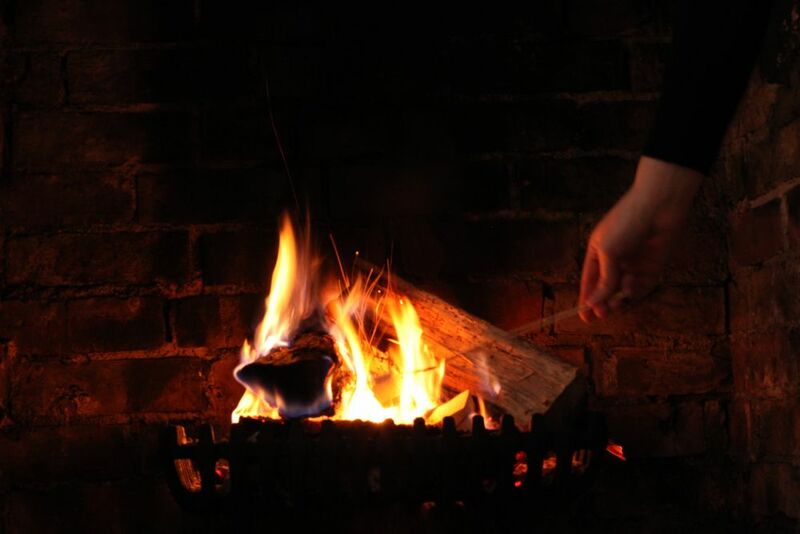 I made new batches of mulled wine and mulled cider, cracked open some champagne and relaxed. Nobody cared about the details. It was a wonderful, warm evening filled with friends I don't get to see enough - of course it was perfect, in its own memorable way. My marshmallows always weep. I've tried different recipes, added and subtracted ingredients, but the effect is always the same. I thought I'd nailed it yesterday but low and behold, they wept overnight. You can solve it by dabbing with kitchen paper and letting the cubes dry again on a rack, but it's such a faff and I'm sure there's something I'm not doing right, even though I love the taste and texture. I haven't included the recipe (just like the first time I made marshmallows) but I'll definitely keep trying and be back soon with a solution. I don't want you to try a recipe I'm not confident about (the archives sometimes keep me awake at night, but that's another story). I tried steeping crushed cinnamon sticks in the water I used for the syrup. I concentrated it by boiling some of the water off before using it but I still lost the flavour once it had been made into marshmallow. In the end I settled for adding normal ground cinnamon at the end. 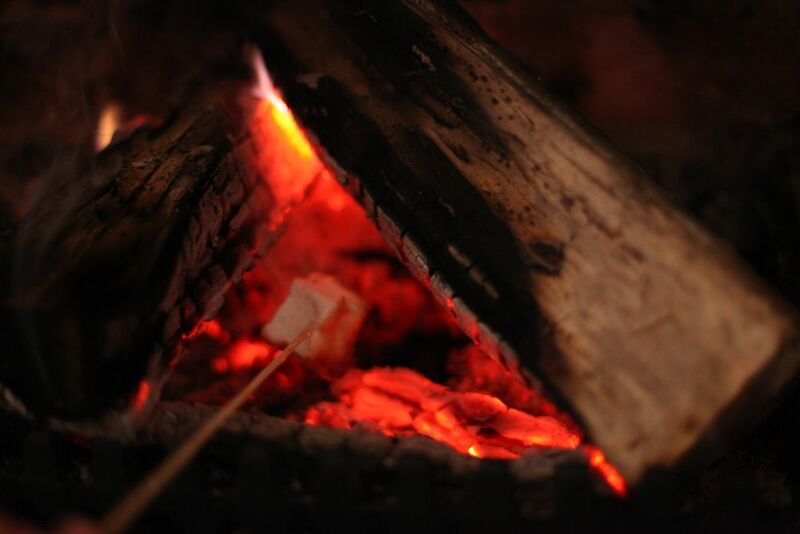 They toast beautifully, browning and burning on the outside and liquifying on the inside - so much so that the one above slid the whole way down the stick. 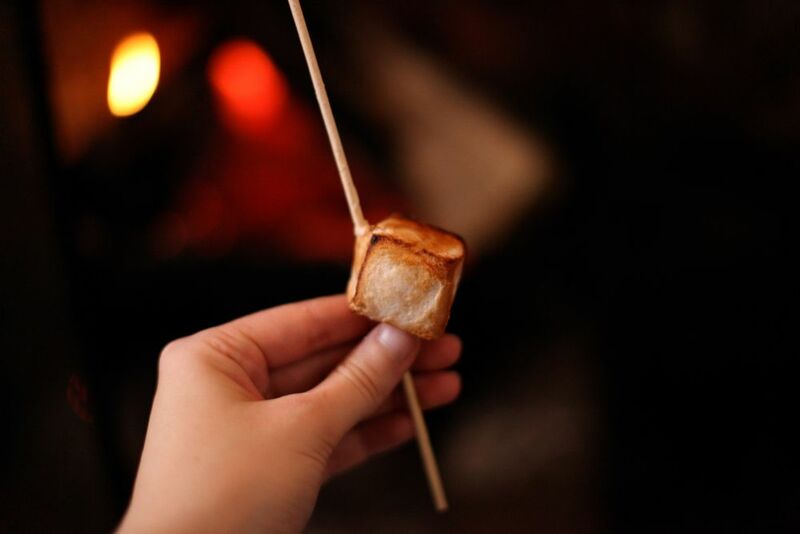 They're sticky, satisfying and warm with spice - do try adding cinnamon to your favourite marshmallow recipe. 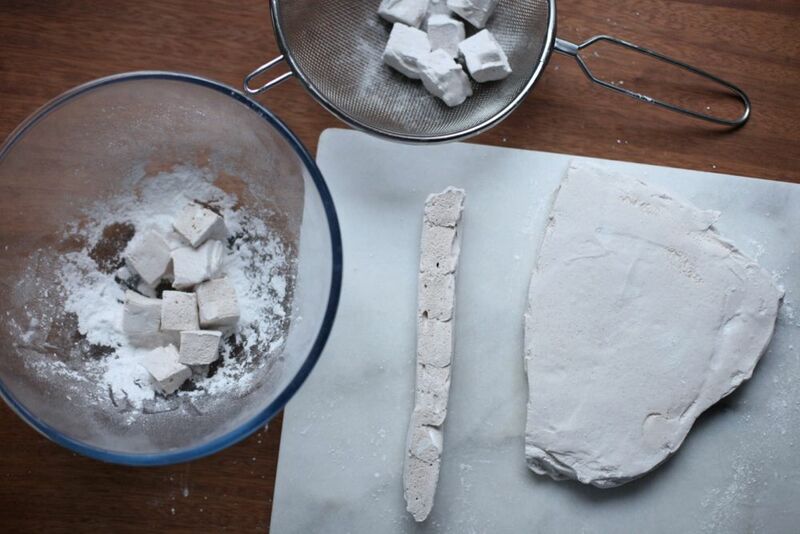 Even if I can't get them just right (yet), homemade marshmallows are always joyful (a bit like parties with good friends). Last Thursday my fridge/freezer died. It did make me appreciate the cold weather, as the garden became our fridge. 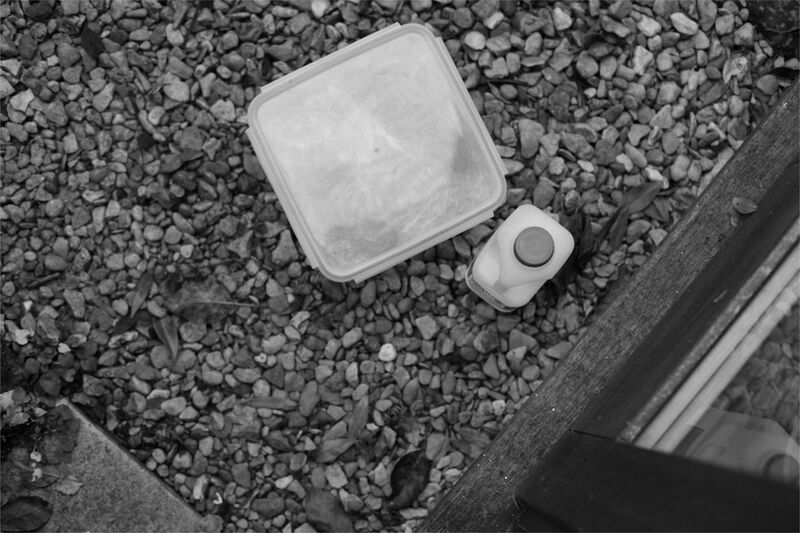 As the weather turned even colder a few days ago, it even became a freezer - but sadly not in time to save our frozen food, which, after one last feast, went down with the leaking ship. The timing wasn't exactly perfect as I'd wanted to make and freeze some things for the the Christmas/Housewarming party I'm throwing on Saturday. I've been overexcited about the party for months - I started a Pinterest board of inspiration a mortifying eleven weeks ago. 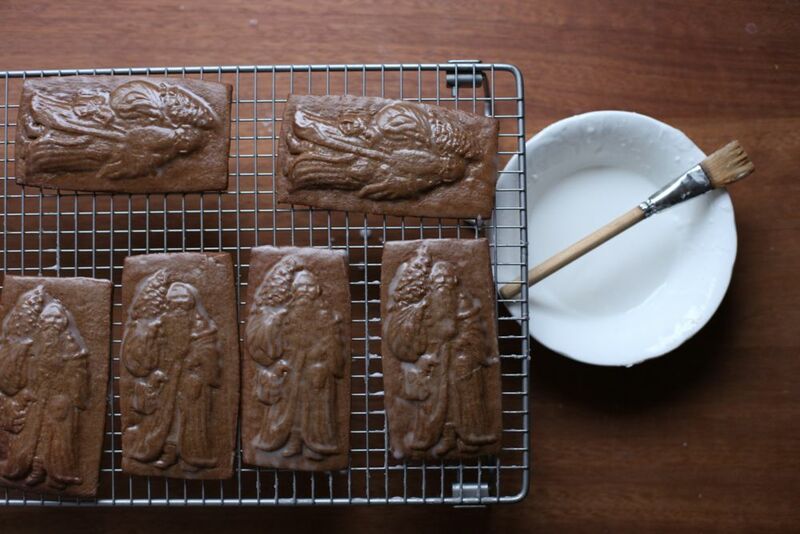 Thankfully these gingerbread cookies can be stored at room temperature. However, the dough does needs to be chilled overnight first. I made a second batch of these on the day it broke, so I tucked the wrapped dough into a snap-down Greg-the-squirrel-proof box and put it outside with the milk. The salvageable fridge items followed it outside the next morning and lived there for five days until I finally received the replacement yesterday. I think the delivery men thought I was a bit weird - I guess white goods don't usually inspire such joy. I like that each print is slightly different - each cookie, especially each face, has its own character. 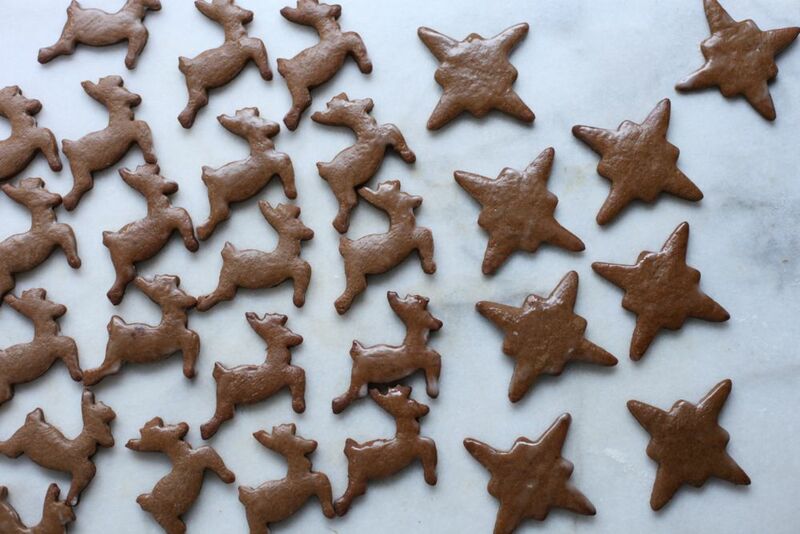 You can also use this dough to make cookies with a cutter. 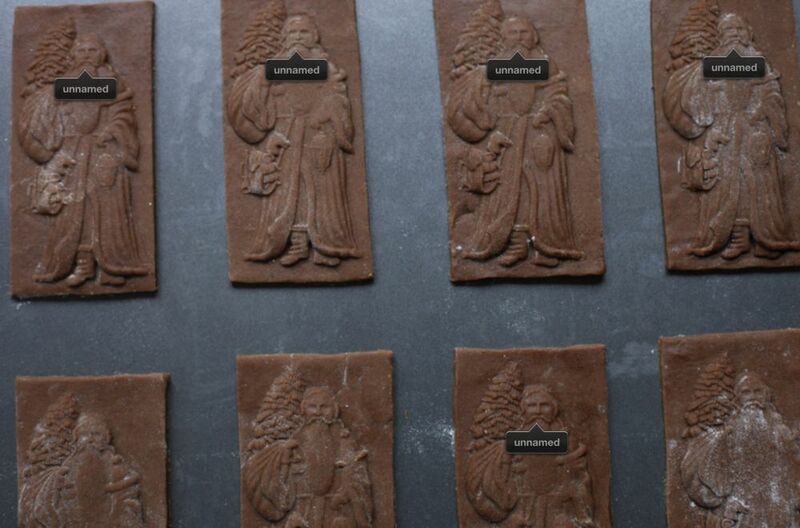 I used some of this batch of dough to make prints and then stamped out smaller ones from the rest. I rolled them quite thin, so they came out hard. 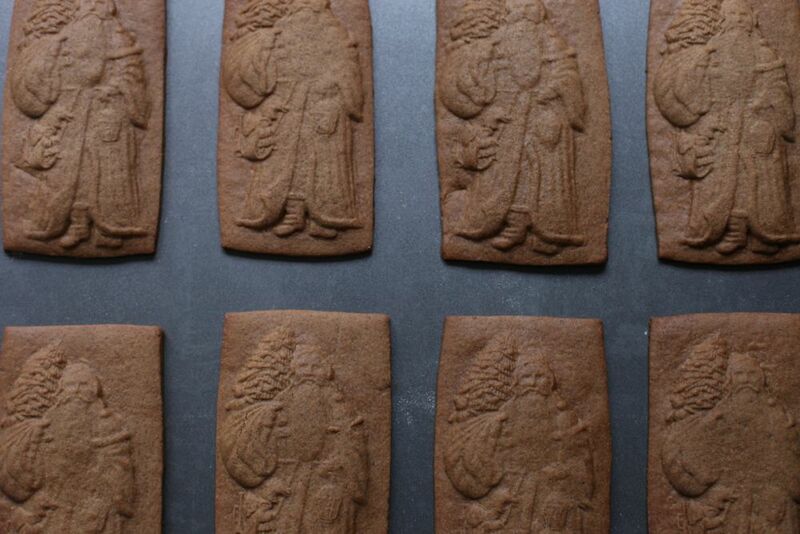 If you prefer soft gingerbread (like the moulded ones) you can roll it thicker. 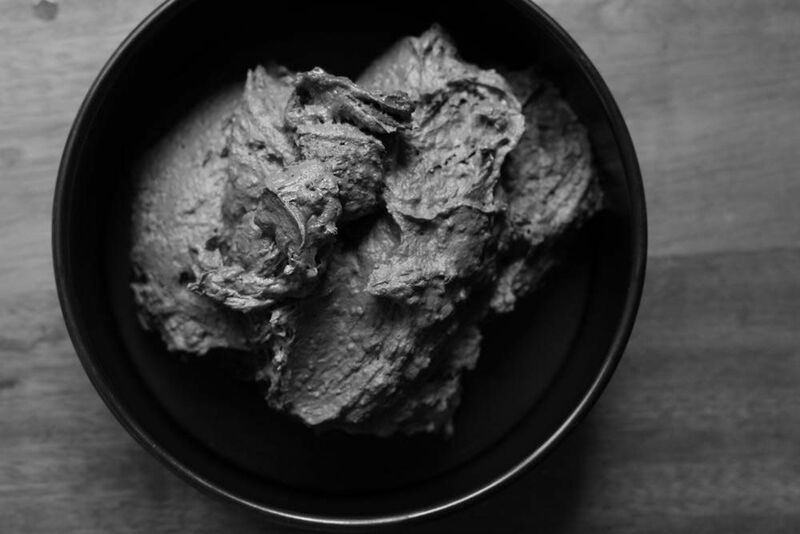 I really like this recipe - which should come as no surprise, since it's adapted from Tartine. I like that you can use one dough for both hard and soft cookies. I like that they keep very well - I baked these last Friday and they'll still be lovely for the party, eight days later. I like how spicy the dough is, stuffed with ginger, cinnamon, black pepper and cloves, all rounded out by a touch of cocoa powder. It's my favourite type of Christmas recipe: one I know I will make for years to come. In a big bowl, weigh out the flour, ginger, cocoa, cinnamon, cloves, pepper, bicarb and sea salt. Use a whisk to stir until the spices are evenly distributed. 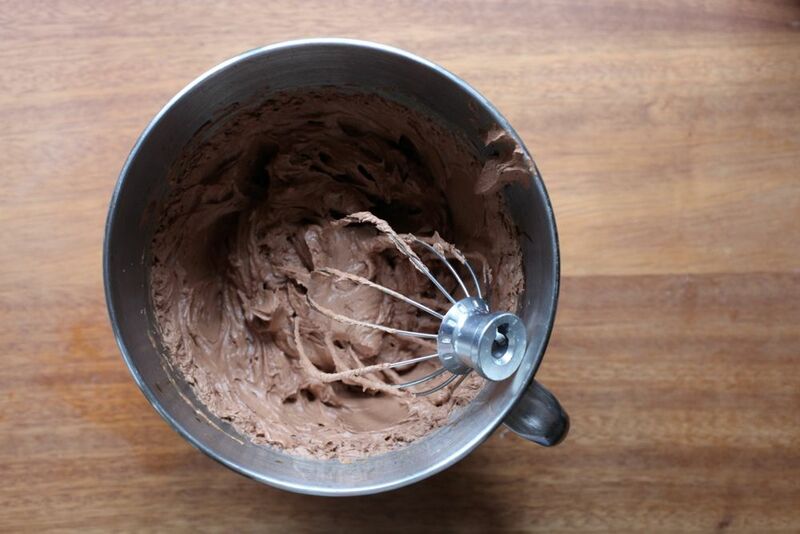 In a mixer, beat the butter until it is soft and creamy. Add the sugar and cream until smooth and fluffy. Beat the egg lightly then add half to the bowl. Scrape down then beat until combined. Add the other half of the egg and beat again. Scrape down again and add the treacle and golden syrup (I took the bowl off the mixer and placed it on the scales, then weighed in the syrups - much less mess). Beat until uniform and scrape down. Add the flour mixture and turn the mixer onto its lowest setting until the mixture comes together (a tea towel over the top can help keep the flour in the bowl). 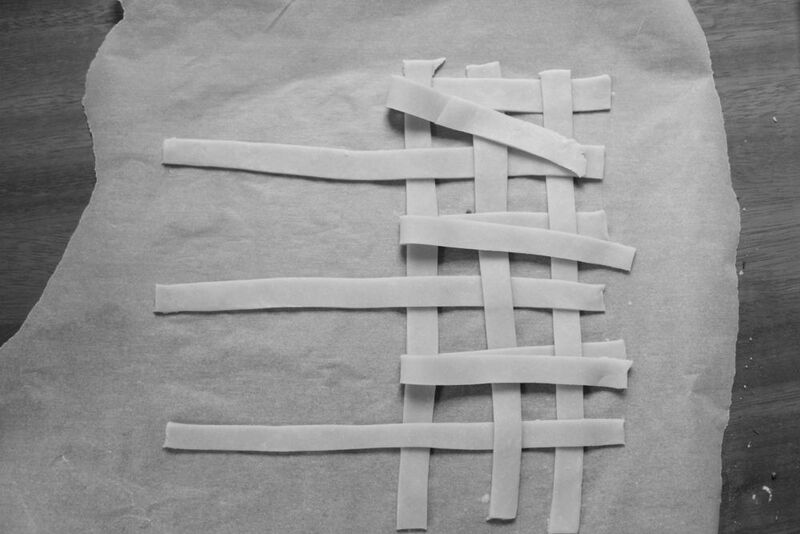 Scrape the dough onto a sheet of cling film then wrap tightly and chill overnight. Preheat the oven to 180C/350F. 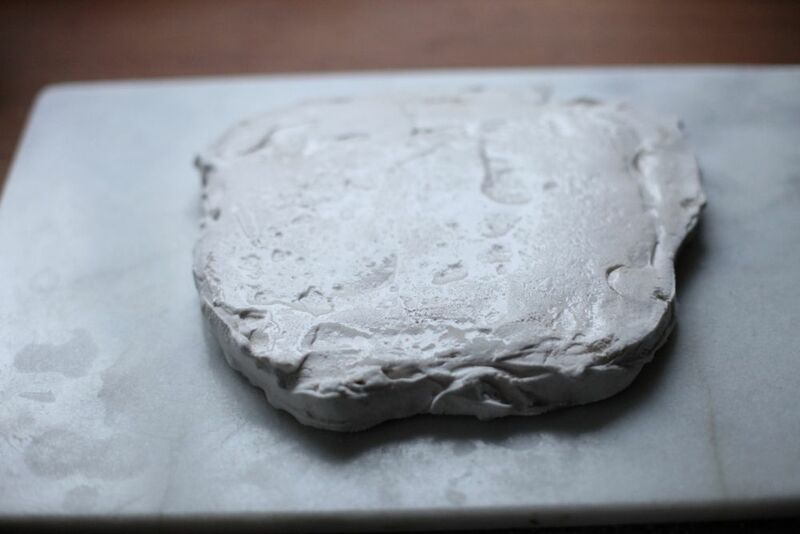 Take half the dough and roll it out on a well floured surface to a thickness of about a cm. 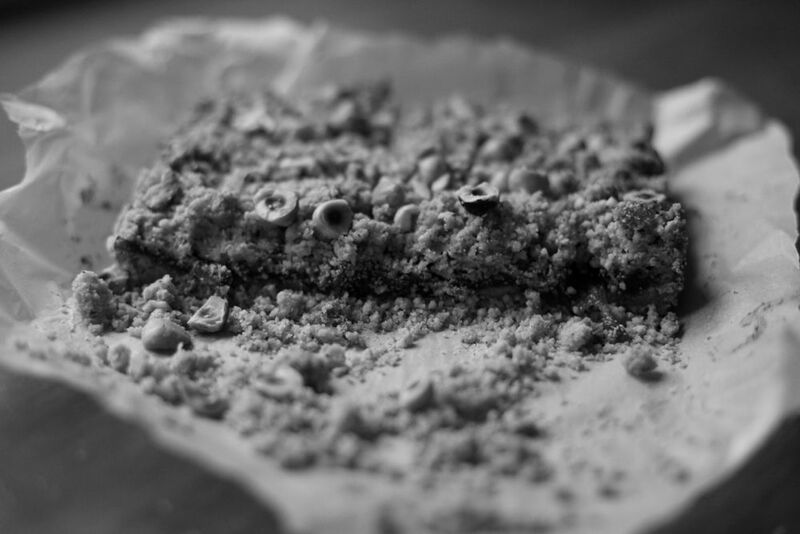 Dust the surface of the dough and the inside of the mould with flour. Place the mould on the dough then press very hard (I stood on a stool to get my body weight behind it). It can help to press the bottom, then middle, then top (or any other series of sections). 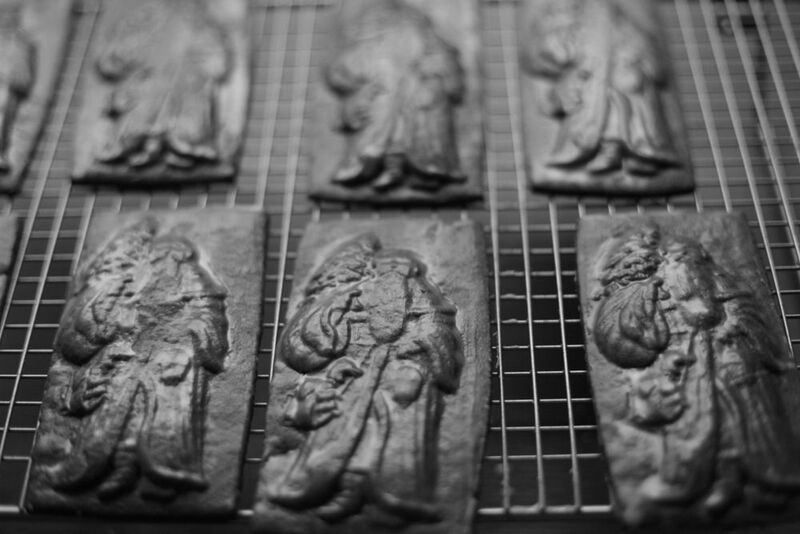 Carefully lift the mould off the dough. If it hasn't printed all of the details, put the mould back down and press harder. If it rips as you pull it up, place another bit of dough over the rip, dust with flour and print again. Slide a palette knife under the print then use a knife to cut it out. Transfer to a sheet. Repeat until you've finished the dough, re-rolling as needed. You can very gently dust excess flour off the prints with a soft pastry brush if needed. Place the tray into the oven and bake for 7-12 minutes, depending on the size and thickness. They should start to brown around the edges but still be soft to touch in the middle. 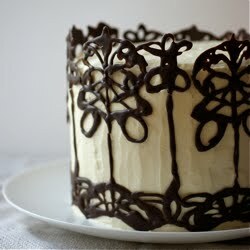 While they bake, whisk together the icing sugar and water. Once the cookies have cooled for 2 or 3 minutes on the sheet, carefully transfer them to a wire rack and gently but confidently brush the surface with the glaze. Repeat with any other trays. Leave to cool on the rack then keep in an airtight box for up to 2 weeks. Updated 19/12/16 - Just to reduce the amount of ground cloves a touch. I also tend to now only make cut out thinner shapes - today I got 116 of them out of it. I've also made this as a half recipe a few times, which works well (just weigh half a beaten egg). 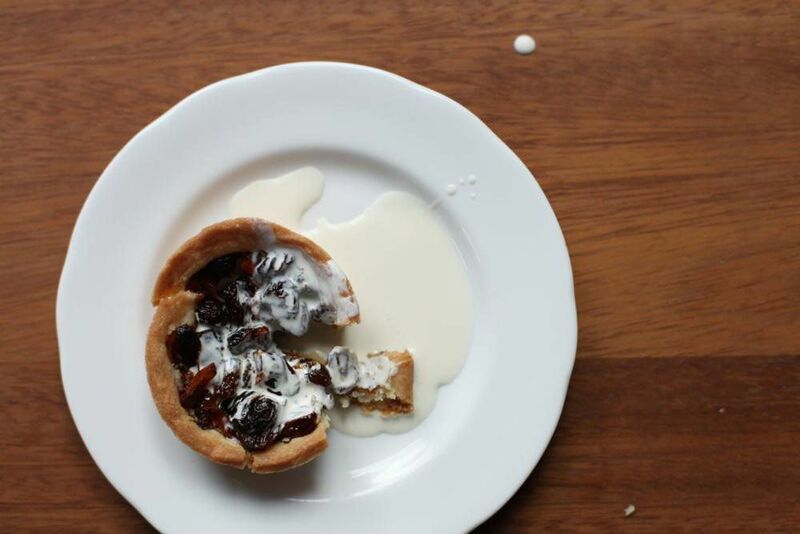 A few weeks ago I was asked by The Everygirl if I'd like to write a piece about one of my favourite festive recipes. Without a moment of hesitation, I chose mince pies. 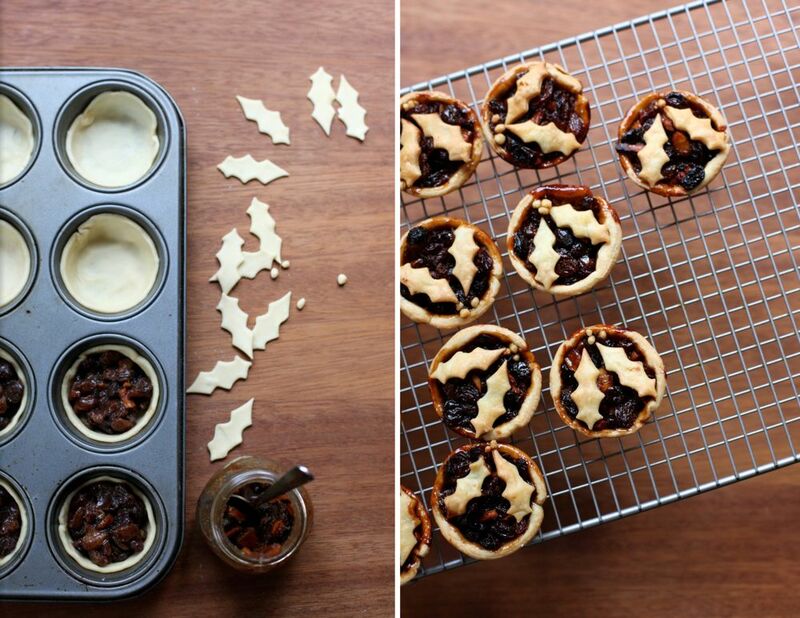 Back in 2010, I posted recipes for our mincemeat and mince pies. 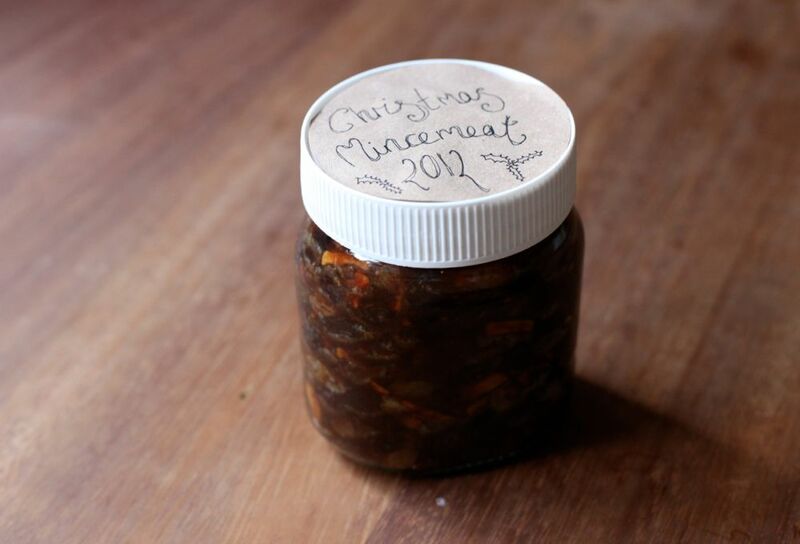 Homemade mincemeat is genuinely one of my favourite things to eat. In a pie, on a spoon - I don't care. It's completely different from the stuff you can buy. For the piece I reshot the photos and adapted the recipes into cups. 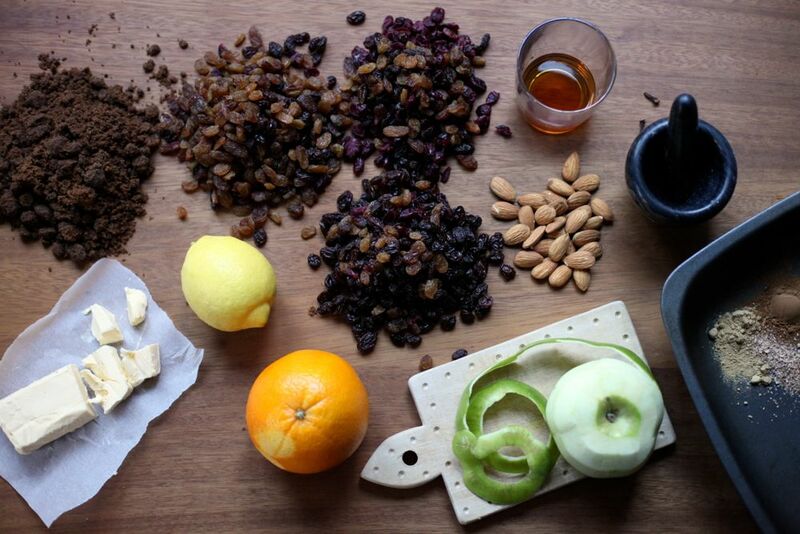 Other than that I didn't change too many things, so the original posts still stand for gram measurements (though the mincemeat is a half batch in the feature, I used a few dried cranberries and I added the brandy at the beginning). You can read the feature here - it also includes recipes from the lovely ladies at Sprinkle Bakes, Butter me up, Brooklyn!, Channeling Contessa and Ever Hungry. 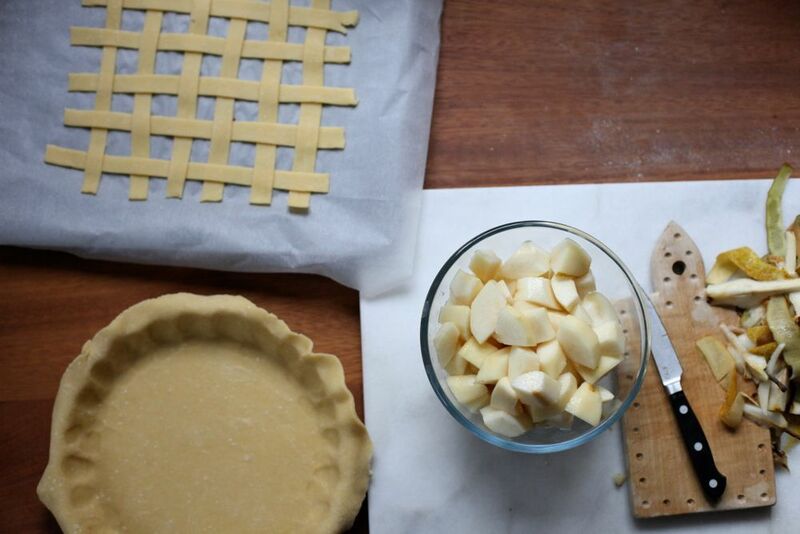 While I was writing up the recipe, an idea kept niggling at me: shortbread instead of pastry. After I'd sent it in, I adapted my Whole Vanilla Bean Shortbread recipe and gave it a go. It was such a success that I wandered around the house for about an hour with a big grin on my face. I used to think that a rich pastry would be too much. It's not. Of course, when I googled it, I discovered that it's a totally normal variation. But still. Best mince pies I've ever made. 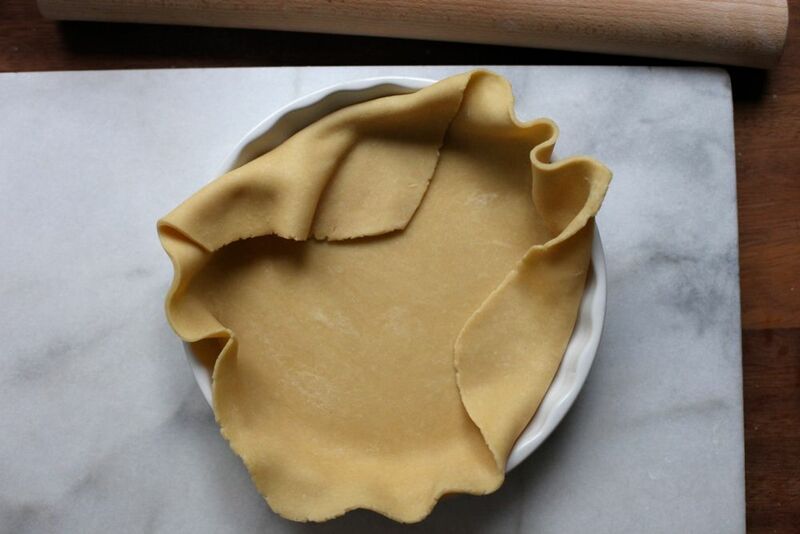 Cut four thin strips of baking parchment and place them across the bottom of four cups in a muffin tin, making sure the ends reach up to the top of the sides (like a ribbon to take out a battery). Place the butter and sugar into a food processor and blend until you have a paste (you could also beat it in a stand mixer, but be careful not to overwork it). Add the flour and pinch of salt and pulse until the mixture has combined and starts to form tiny clumps. Divide the mixture between the cups then press into the walls and bottom as evenly as you can. Neaten up the top with a knife if you like - you can use any extra to make decorations. Place in the fridge and chill for at least 30 minutes. Preheat the oven to 160C/320F. Spoon about 3-4 teaspoons of mincemeat into each cup. Bake for 16-18 minutes until the shortbread is golden brown and the mincemeat is bubbling. Leave in the tin to cool for five minutes them use the strips to pull them out of the tin. Serve warm with plenty of cream. Though I know it's meant as a compliment and is very sweet, it makes me nervous when people's expectations of my cooking are set very high. For instance, when people who don't know me have been told to expect something incredibly delicious when I bring something to a party or event. Though I love cooking for people, I do find it stressful. I spent a faintly ridiculous amount of time trying to work out what to bring to an event I went to this week. It had to be something that I could take in the basket of my bike. I didn't want to assemble, bake or reheat it when I got there. I'd never cooked for any of the guests before and so I had no clue about their likes or dislikes. Yet I wanted each person to feel it was worthy of the announcement: Emma will bring a superb dessert. I decided that I'd make a Ginger Bourbon Pecan Pie, one of my favourite recipes. Then I realised that I needed to be able to write a post about it, as I've been testing for another project (announced here). That meant trying something new, as I don't have anything appropriate in the wings at the moment. An untested recipe adds another layer of danger to the situation - though I guess it does have a built in excuse for something being less than spectacular. 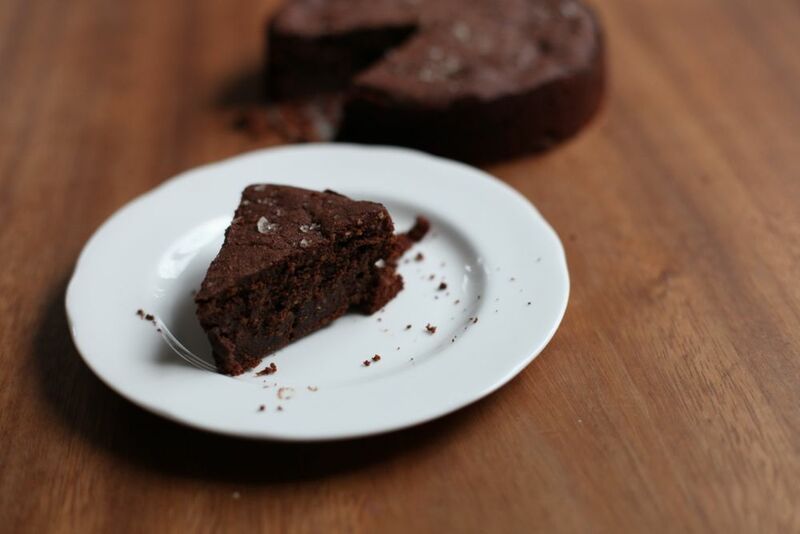 I thought chocolate would be a safe bet so I turned to Alice Medrich's wonderful Sinfully Easy Delicious Desserts and found this 'Queen of Sheba Torte'. This version has been tweaked by Alice so that it's a one bowl recipe with no need to separately whip the egg whites. It's very clever. A big packet of smoked sea salt has been lingering unopened in one of my cupboards for ages as I didn't quite know what to do with it. When Steph posted her Dark Chocolate Espresso Cookies with Smoked Sea Salt (also, coincidentally, adapted from an Alice Medrich recipe) I realised that I needed to pair it with dark chocolate. 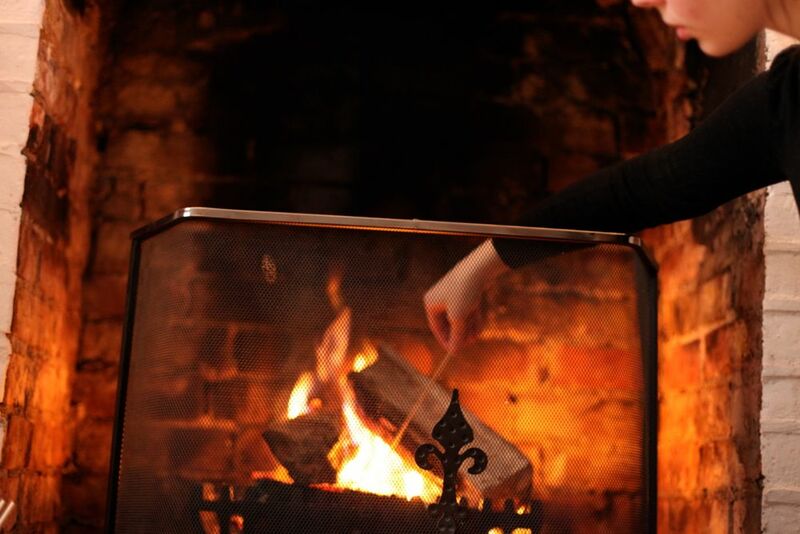 I also thought that hazelnuts would work wonderfully with a hint of smoke, so I swapped the almonds for hazelnuts. On the night, the cake - still in the tin, cloaked in foil with an elastic band belt - joined a pot of double cream, my whisk and the remainder of the Raspberry Caramels in my bag. I tucked it all into my basket and cycled off into the murky drizzle to await their verdict. While it seemed to go down fairly well, I wasn't totally happy with it. I didn't have any 70% chocolate, so I'd used 85% and added a little more sugar - I don't think it needed it. I also thought that I'd slightly overcooked it and it could do with a teeny bit more smoked salt. 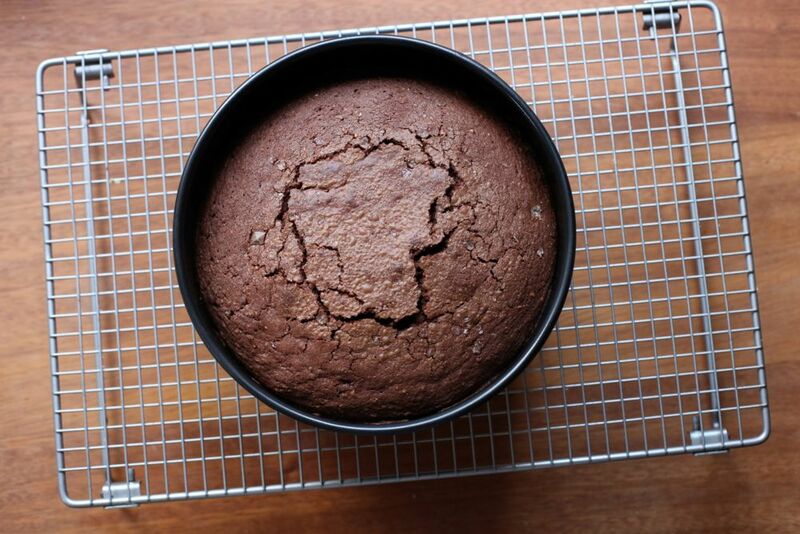 So I made a half recipe yesterday in my 6" tin, baked for 18 minutes (this version is in the top and bottom photos, I've put a full recipe below). Just as I finished, I realised I could have used cocoa powder in place of the flour to give it a bit of extra punch - another time. I'm happier with my second attempt (though I think I might have very slightly overdone the salt this time) and I'm looking forward to trying it again tomorrow - apparently it's best after about three days. 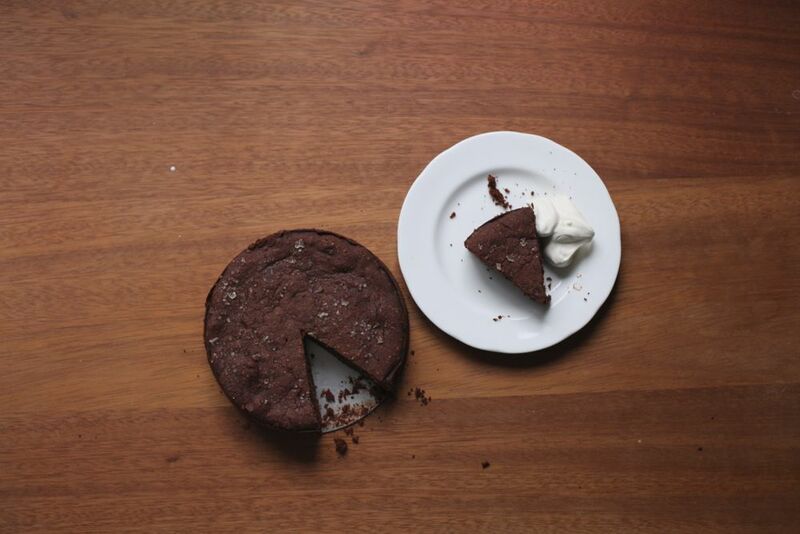 Finally, if you pull out a torte that looks like the one below, do not panic. I got rather worried that it looked like a normal cake and keep going back and forth to the kitchen, willing it to sink (definitely a first for me). Thankfully, it shrank, puckered and cracked as it cooled. P.S. 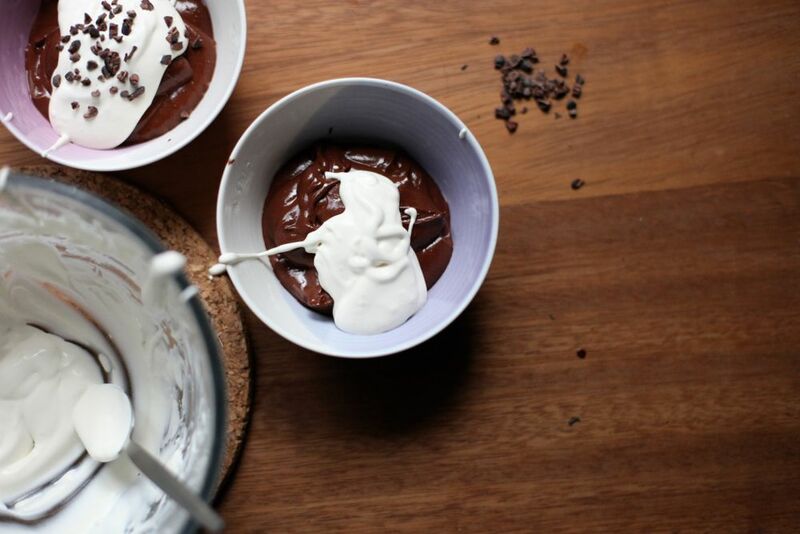 Do try the mixture before you bake it - it's sort of like mousse. Amazing mousse. Preheat the oven to 180C/350F. Lightly butter an 8" springform or loose-based tin. 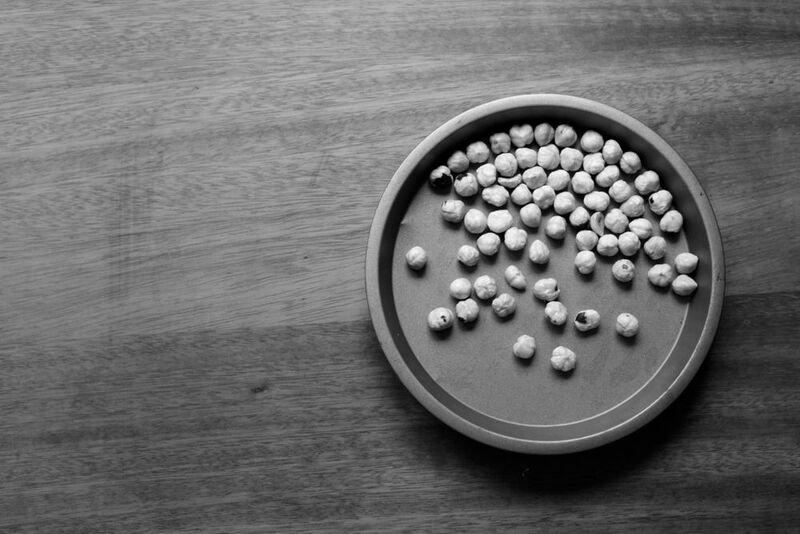 Place the hazelnuts on a small tray in the oven and toast for a few minutes until they start to smell and darken slightly. If they have skins, rub as much as you can off with a tea towel. Put into a food processor with the flour and blast until they are finely ground. Place a mixer bowl (or another bowl if using a hand mixer) over a pan of barely simmering water. Chop the chocolate up and tip into the bowl. Stir occasionally as it melts. Meanwhile weigh out the brown sugar and salt and cut the butter into cubes - it should be starting to soften, not squishy. 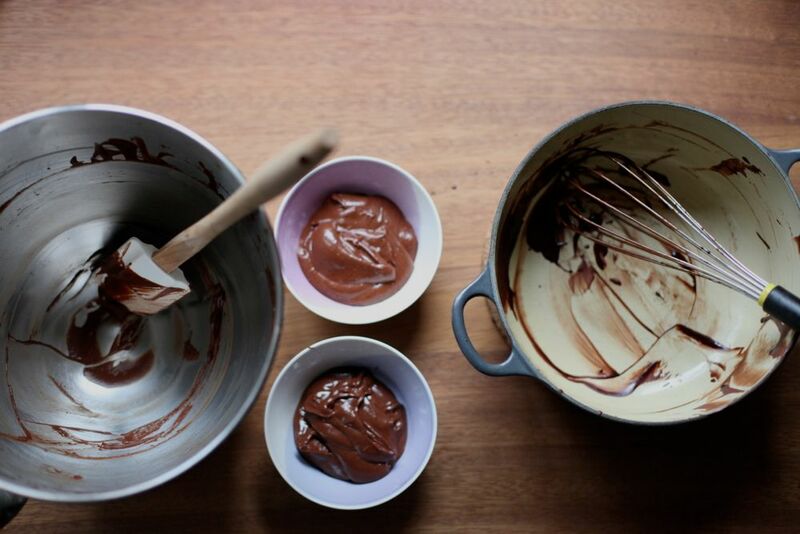 When the chocolate has nearly melted, take it off the heat and stir until it's smooth. Place on the mixer (with the whisk attached) and add the sugar, salt and butter. Whisk on medium until the ingredients have fully combined and the mixture has lightened a little. Scrape the sides down then add the first egg. Whip until combined, then add the next egg. Repeat until they're all combined then add the vanilla and whip for 1-2 minutes on high until stiff and pale. Add the ground hazelnuts and fold in. Scoop into the pan and level out. Sprinkle the smoked sea salt over the top. 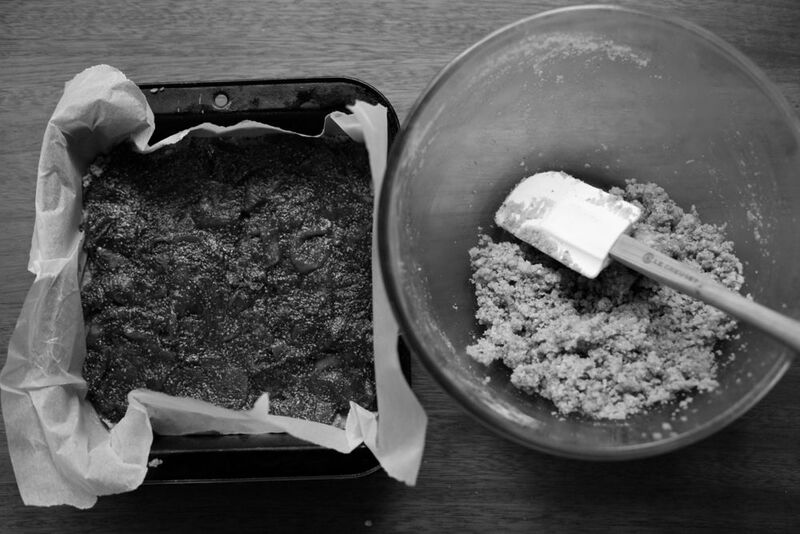 Bake for 28-35 minutes - a tester should still bring up a few sticky crumbs. Place on a wire rack and leave to cool fully in the tin. Wrap in kitchen foil and leave for at least one day and up to three before serving. Lovely with a big spoonful of whipped cream or crème fraîche. You know how sometimes everything you cook is just a little bit off? Not ruined, not inedible - just not what you'd expected. This week has been like that. Every day I wake up and think that today will be the day when I get my act together. After many experiments and accidents, I don't have a recipe for you this week. Instead, I have two ideas represented by two sets of photos. It seemed a shame to waste them. After writing about the hidden scaffolding of rules and habits behind this blog last week, it seems almost appropriate to break them. First, I made a pear pie that had a bit of a soggy bottom (I dread to think what Mary Berry would have said). My mum came to visit last weekend as there was a tiny slit of light in my schedule. 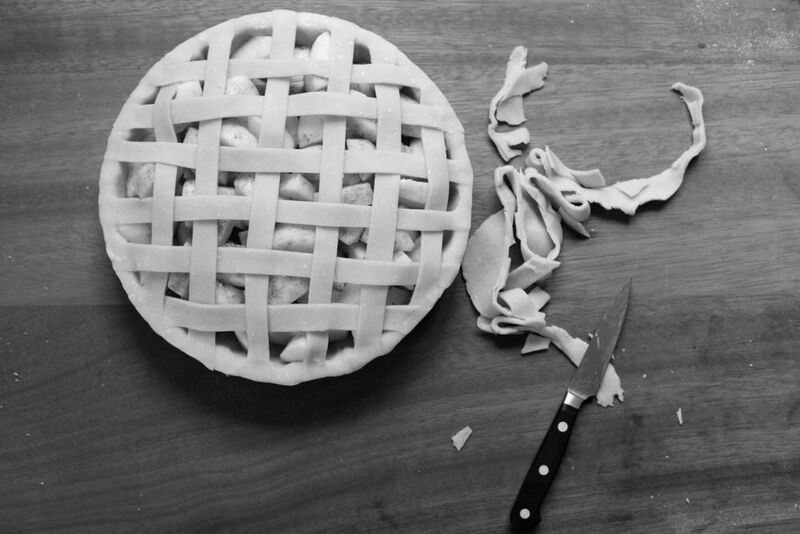 The main reason the pastry went wrong was that I had to take the pie out of the oven early or she would have missed her flight home to Switzerland as she refused to leave without tasting it. 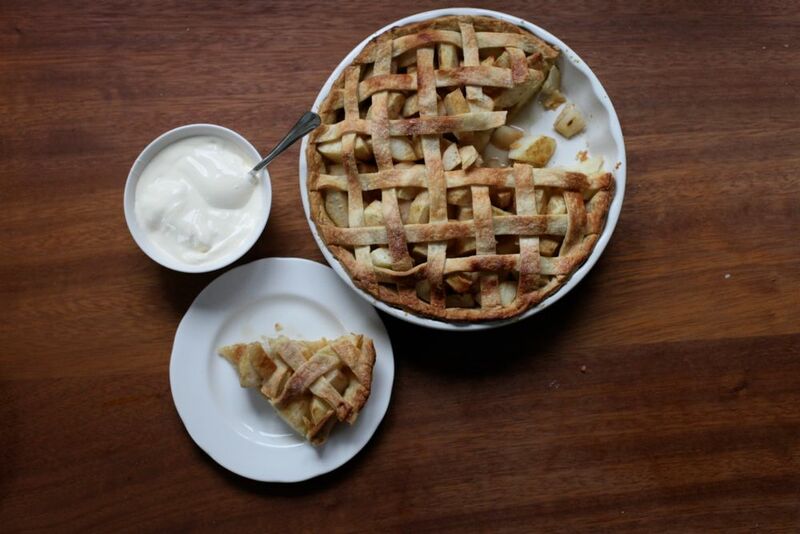 I've also never made a pie with a pastry base in this ceramic dish - I think a metal one would be better. 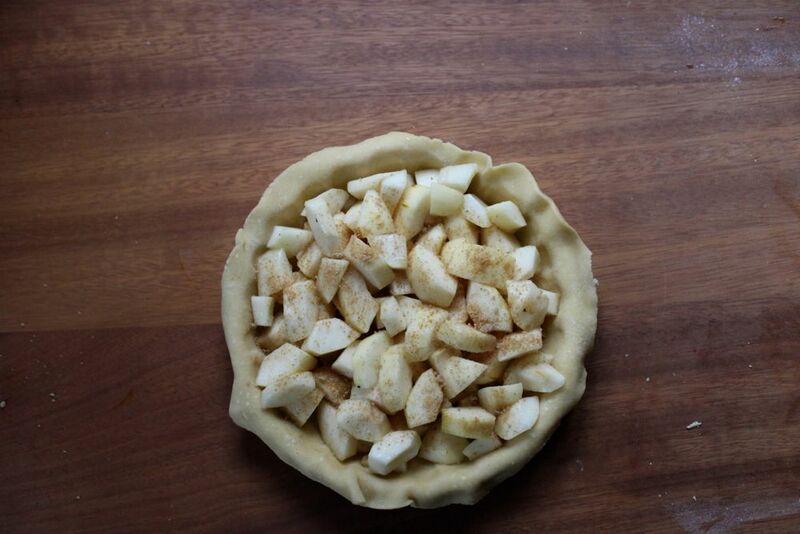 You actually don't really need a recipe for this - just use your favourite pastry recipe (I used the one from the Apple and Quince Pie) and fill with chunks of firm but ripe pear. 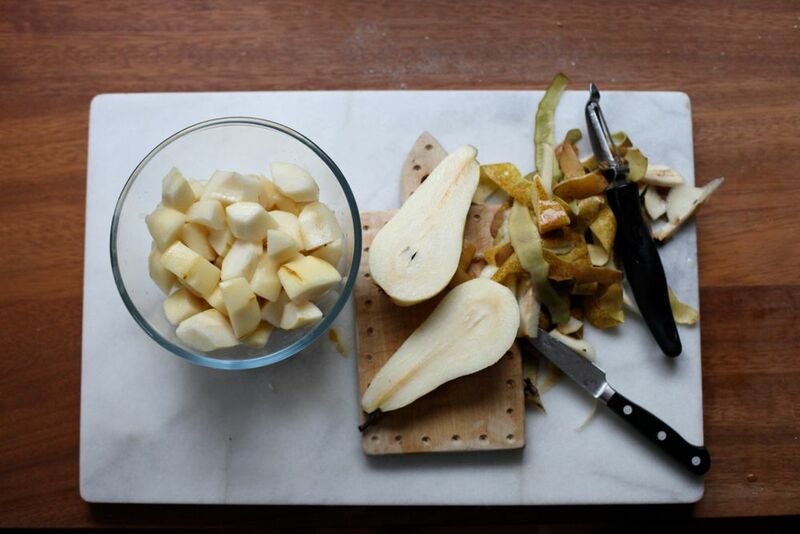 I mixed a tablespoon of brown sugar with half a teaspoon of ground ginger and sprinkled it between each layer of pears. 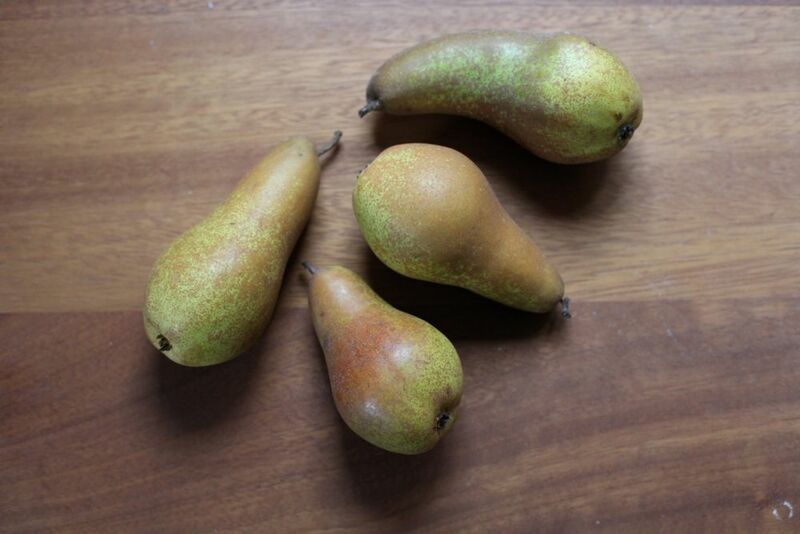 The pears were concordes and were some of the best I've ever tasted. 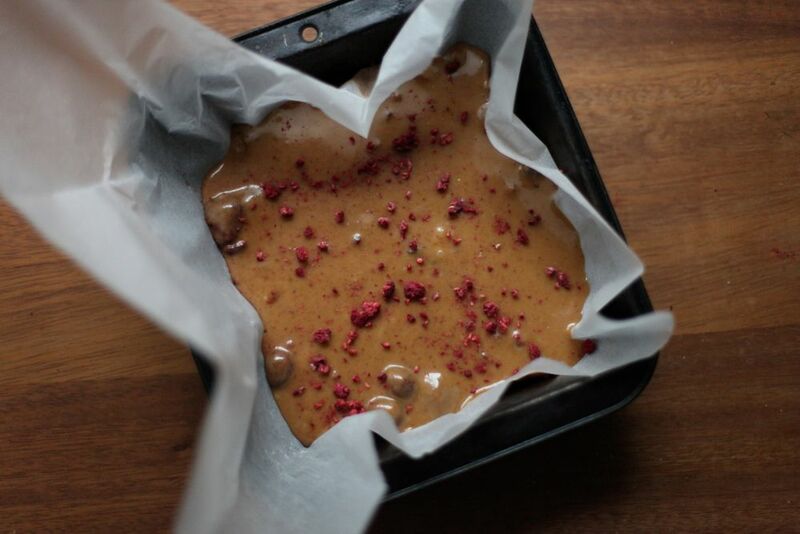 I also tried to make some freeze-dried raspberry fudge, inspired by some I ate on my trip to Edinburgh a few weeks ago. It was my first attempt at fudge. I appear to have made caramels. 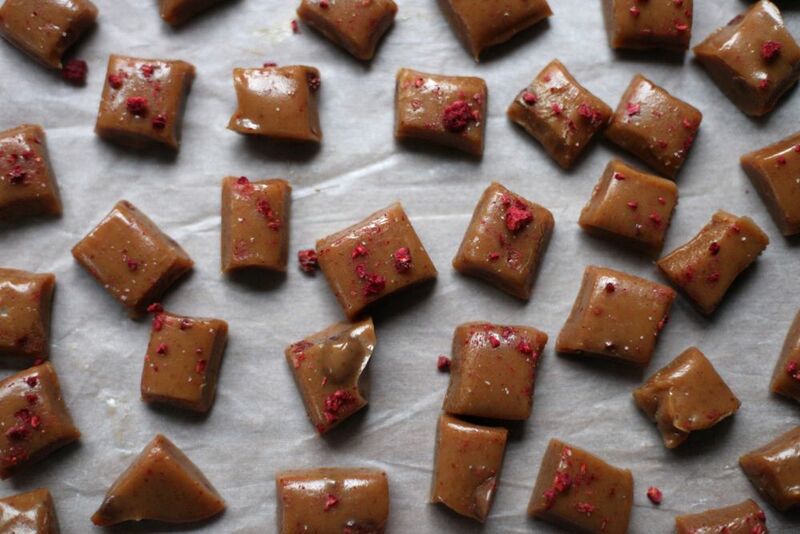 Absolutely gorgeous, vanilla-flecked, raspberry-studded, salted caramels. But as they're not what the recipe was meant to make and I can't test it again today to check, I don't feel comfortable giving you the recipe. I think the pastry gods were trying to tell me something - caramels appear to be an even better place for the raspberries than fudge. 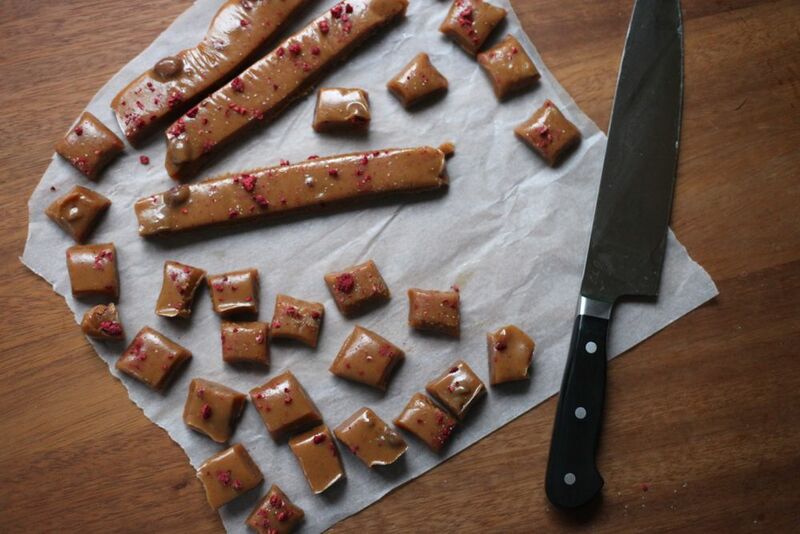 If you can't wait for me to do more testing, you could try finishing a tin of salted butter caramels from David Lebovitz with a handful of crushed freeze-dried raspberries (I stirred some in, too, hence the slightly weird bumps). It's quite different from the recipe I used but I think it would give you a similar taste and texture. Do you like having a set of rules to follow? This week someone reintroduced me to a set of blogging tips by Joy the Baker. A few days later The Times ran a list of blogging rules. This evening I watched the Blog, Inc. Virtual Chat. All three things made me think about my own rules. After three and a half years of blogging I have a lot of habits and systems. There's a big framework behind the blog - a rabbit warren full of tunnels hiding under the surface. Even the things that are obvious if you look for them (the top photo is always of the finished dish then they're in chronological order) hopefully slip under the radar while you read. Over time it's rebuilt but the main frame stays the same. I'm attached to that frame - I like patterns. Work out what your rules are. The only real way to do that is to practice, experiment and observe. What do you like about your favourite blogs? Does it annoy you when somebody does x? Which posts do you like and which turn you off? What is important to you as a reader or follower? What are your strengths? Never stop thinking about what you're doing. Keep editing, keep polishing and pushing forwards. Try not to spend your time and energy worrying about numbers and success - concentrate on what you do and doing it well. It is hard work, though not everyone will acknowledge that. But if you love it? It's worth every single moment. They say rules are made to be broken. The first thing you do in this recipe - melt chocolate with water - feels wrong. Water usually makes chocolate seize. 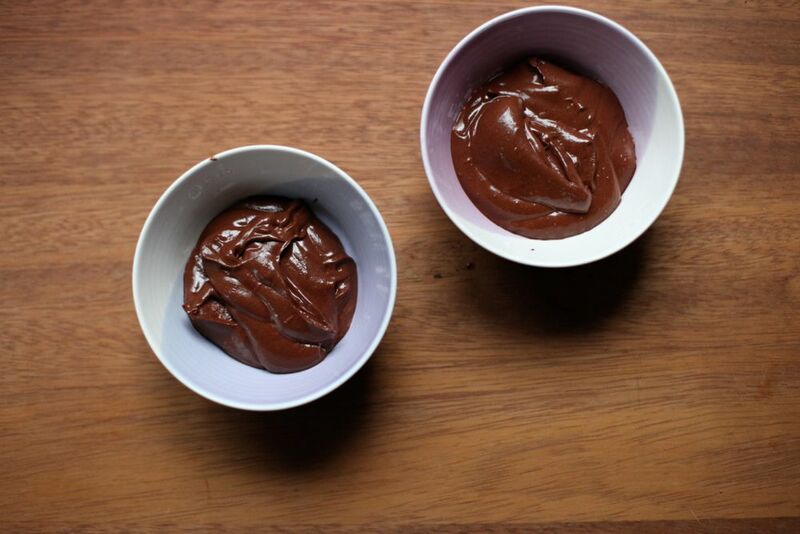 So how can you make mousse out of just chocolate and water? It sounds impossible but it works. The technique was pioneered by Hervé This, a French chemist. There's a video of Heston Blumenthal making it (without his glasses, which is quite disconcerting) and James made it in the BBC Great British Bake Off semifinal. It's not quite like a normal mousse. 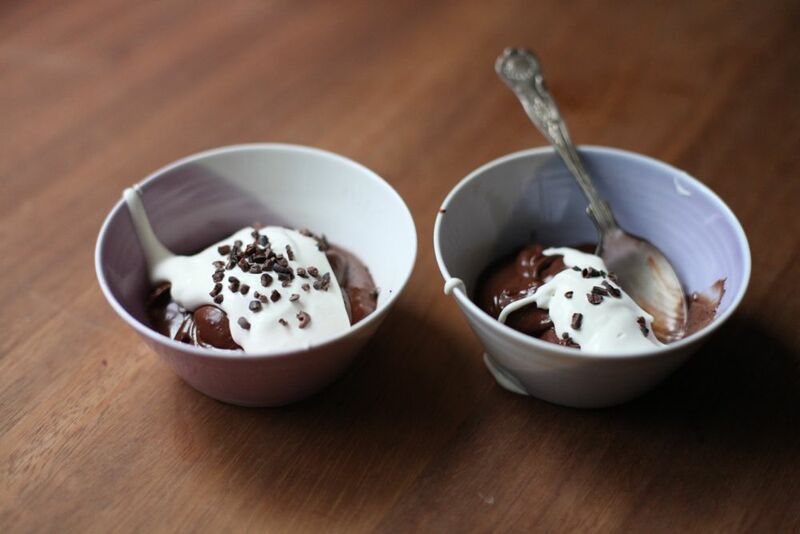 It's more creamy, akin to ganache, and very rich. 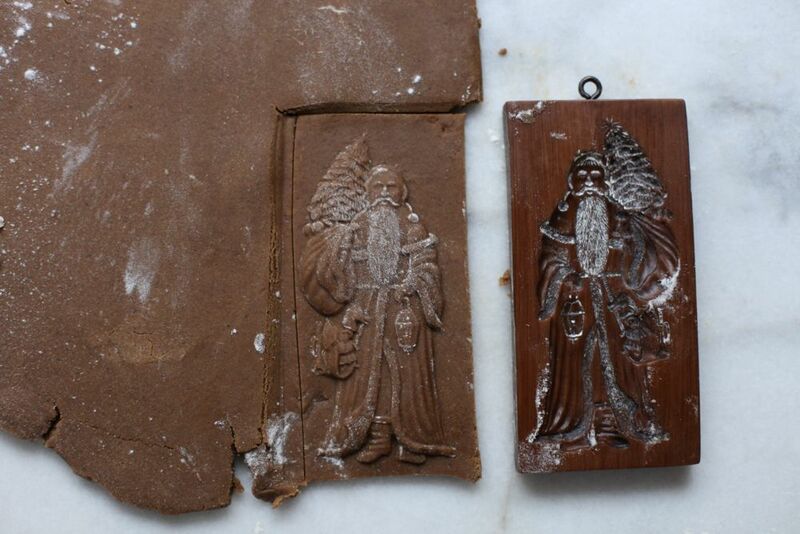 Use a chocolate that you love the taste of - it's the only flavour so it needs to be good. I left it at a thick pudding stage but I think you can go a little further before it becomes grainy. I added a bitter cocoa nib crunch and soft, just-whipped cream, but this really is a blank canvas. Perhaps you could add flavours into the water (fruit puree? alcohol?) or scrape it into a blind baked pastry case. If you're struggling to get cocoa nibs (lots of people seem to miss them out of the Salted Caramel & Cocoa Nib Brownies), I recently bought some online from Sous Chef as I haven't found them in Oxford yet. I've bought a few things from that site and they've always been good quality. I've also found the nibs in health food shops elsewhere. 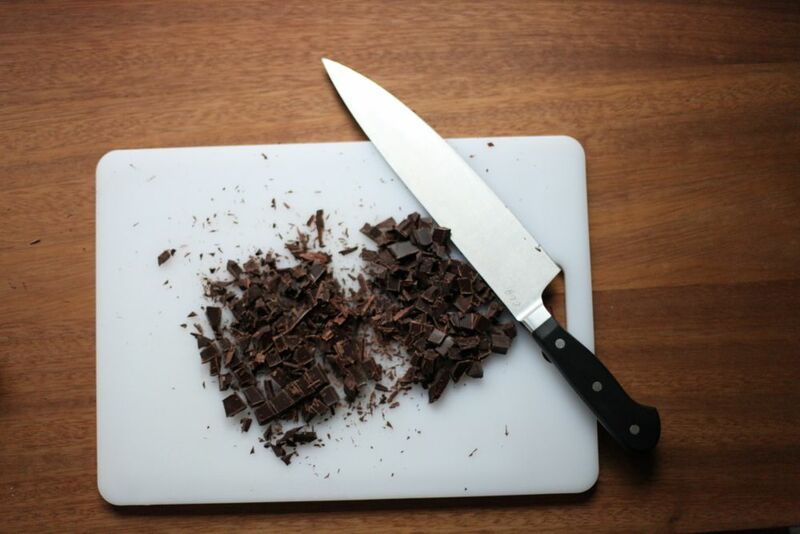 Chop the chocolate up into chunks. Put the ice into a bowl then fit a metal bowl (if possible, it will let the mixture cool faster, meaning less whisking) into it. Add some water to the ice to make sure the bottom of the top bowl is submerged and cooled. Get a whisk and serving bowls ready. 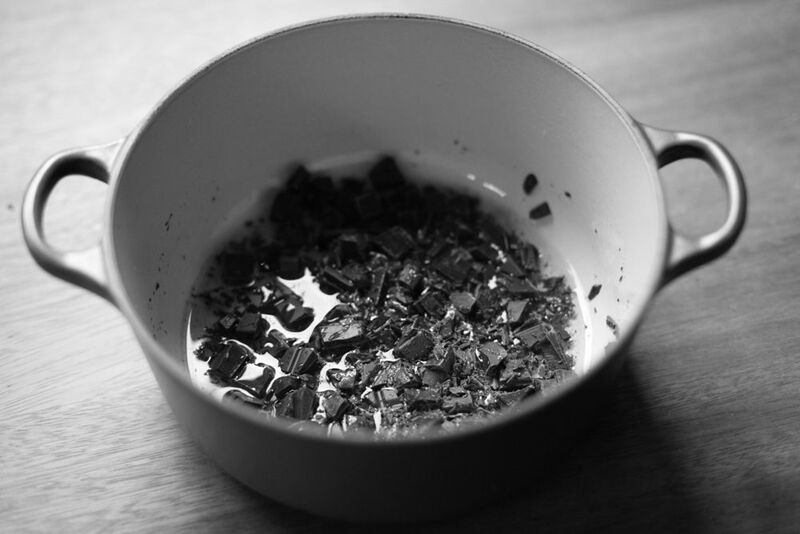 Place the chocolate into a saucepan with the water. Warm over low-medium heat until the chocolate has dissolved and you have a smooth liquid. Pour into the cold bowl and start whisking immediately. As you whisk, the mixture should start to slowly thicken. Keep going until it holds thick ribbons. Quickly transfer to your serving bowls before it starts to set. Remove the chocolate bowl from the ice and replace with a clean one. Pour in some double cream and whip until it holds soft peaks. 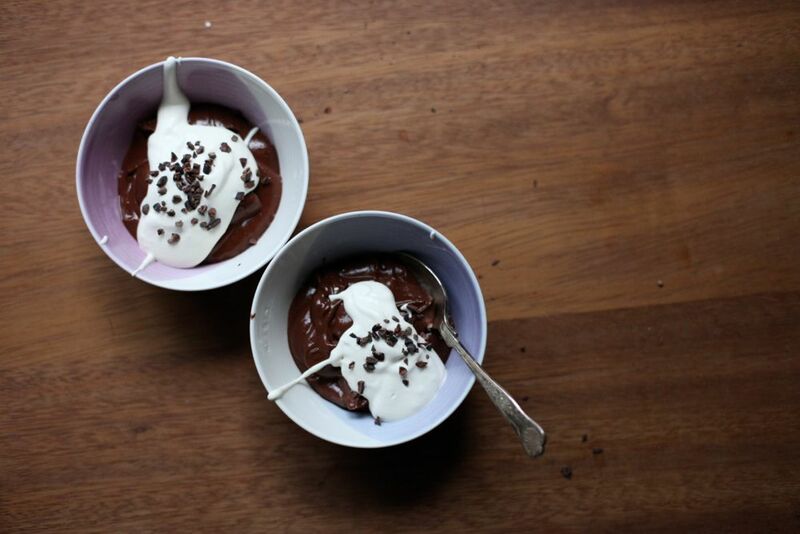 Spoon over the mousse and sprinkle some cocoa nibs over the top. Serve immediately if possible. If not, place in the fridge then bring up to room temperature before serving. 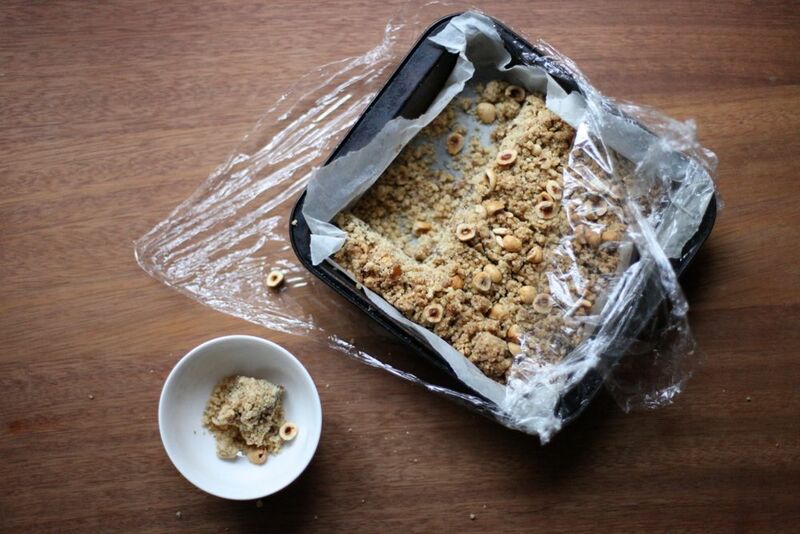 Almost two years ago to the day, on the 14th November 2010, I posted a recipe for Date Crunchies. I've been eating the little squares of buttery semolina crunch with a lemony date filling all my life. As with most people, when I'm stressed, tired or ill, I reach for the food of my childhood. Just as I was in that post two years ago, I'm stressed about work at the moment - it's a very deadline-heavy and time-short patch of term. I needed some crunchies but this time I wanted to try a variation. A few weeks ago I was perusing the bakery section in M&S when I spotted a little sample tray of bread cubes. Curiosity piqued by the idea of a 'fig and hazelnut loaf', I tried one. It was so good that I gave in to the marketing ploy and bought a loaf (don't tell anyone I said this or I'll get pitchforked by the purists but it's wonderful in a streaky bacon sandwich). I'd been thinking about fig as a filling for an updated crunchie for a few months but it felt like it was missing something - hazelnut was the answer. I swapped the dates for figs, lemon for orange, some of the flour and semolina for ground hazelnuts and scattered some more hazelnuts over the top. I spent at least five minutes debating in my head if it was too predictable for me to brown the butter. In the end I gave in (as I always do). My defence is that as it's beurre noisette and the whole point is that it's hazelnutty, I had to. The final product is crumbly (hence the new name), crunchy and gloriously full of that noisette - I can't tell where brown butter ends and hazelnut starts. The fig filling has a lovely bit of chew, but it's the seeds that are the best bit: they crackle almost like popping candy. Finally. The reason that you don't have a picture of a full tray is because darkness fell while they baked. So I had to save them for today. I couldn't resist. Preheat the oven to 180C/350F. 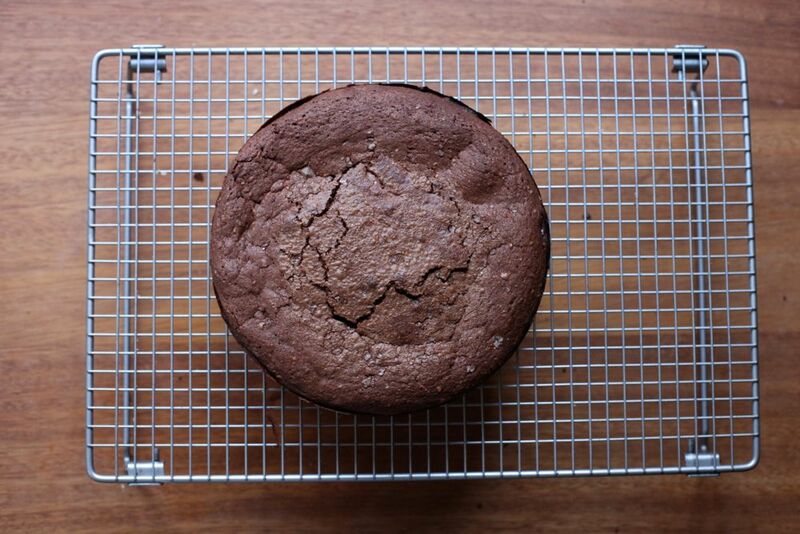 Line a 20cm/ 8" square tin (or similar size) with baking parchment. Place 75g of the hazelnuts in the tray and toast for a few minutes. If they have skins, rub them in a tea towel until most of the skin has come off. Place the butter into a medium pan and heat until you have brown butter (see here for more instructions/tips) then leave to cool. 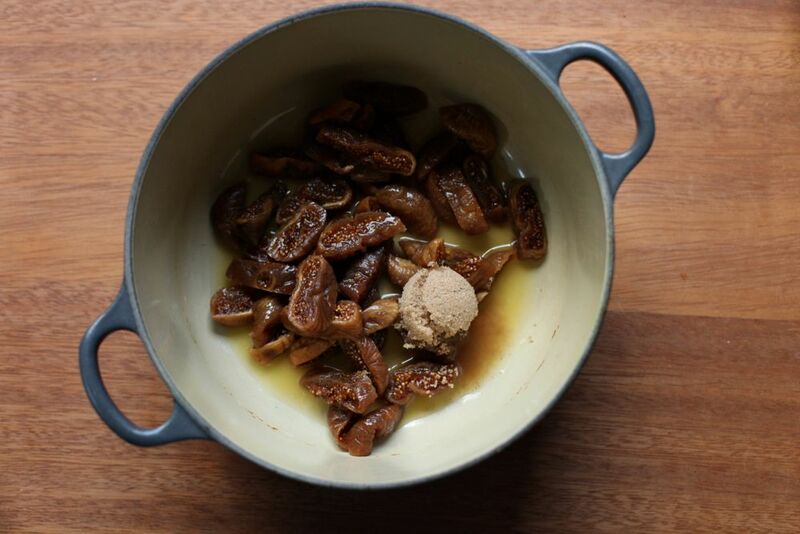 Chop the figs up into small chunks and place in a saucepan with the water, orange juice and brown sugar. Heat until the figs have softened into a spreadable paste (still with some lumps) - help it along by squishing them with a spatula/spoon. By now your hazelnuts shouldn't be too hot, so place them in a food processor and blend until they're finely ground. 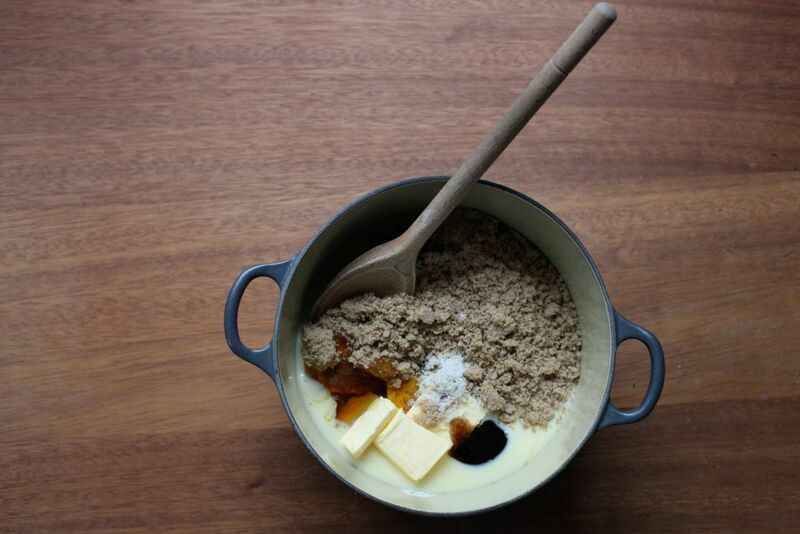 Tip into a mixing bowl and add the flour, semolina, brown sugar, baking powder and salt. Use a whisk to stir everything together (it's a great way to combine dry ingredients when they'd struggle to get through a sieve). Pour in the brown butter and stir until just combined. Tip half of the mixture into the tray and press down into an even layer with a spatula/spoon/your hands. Scrape the sticky fig mixture into the tray and spread it out, trying not to pull up the base. Finally add the rest of the mixture to the tray, spread out (press down a little - I didn't and mine was very crumbly on top) and fork up a little so you get some pebbles. Roughly chop the remaining 25g of hazelnuts and sprinkle them over the top. Bake for 25-30 minutes until golden brown. Leave to cool in the tin, then chop into bars. Keeps well - I think they're better on the second day.